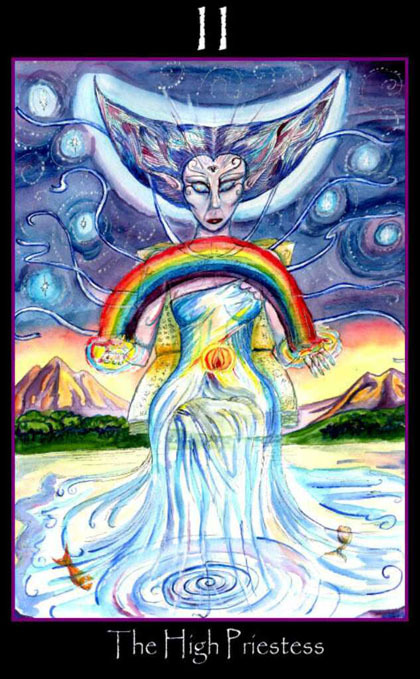 Tarot of the Sidhe (with cards) is about transdimensional beings that are figures of great power with a deep and lasting connection to our world. They are wise, sometimes tricky and elusive, but always noble. Each of the Major Arcana cards includes the Great Glyph of the Sidhe, which is intended to act as a gateway into the card for visualizations purposes � to connect with the archetypal energy. The Major Arcana retain their traditional titles except for the Hierophant (The Elder) and the Devil (Pan). The four suits are: Dreamers (Water), Warriors (Fire), Dancers (Air) and Makers (Earth). Artist Emily Carding literally channeled her drawings and the result is a style that is both spontaneous and robust, bursting with color and energy. The High Priestess is standing over a body of water, her translucent skirt flowing into the water, with small fish swimming around her . A rainbow rests on the palms of her hands. Behind her in the distance we see mountains.